This cross was laid flat by Oxford City Council in the winter of 2013/14. Although Harriet died over 19 years before her husband in 1860, the inscription must have been done after the death of John Axtell in 1879. John Osier Axtell was born near Yarnton in 1813 and baptised as John Hosier at Kidlington Church on 17 October. He was the son of Elizabeth Hosier or Osier, a single woman; and his father, who had to pay maintenance for him, was John Axtell of Yarnton, who was an agricultural labourer. On 10 October 1813 (exactly a week before Elizabeth Osier had their son baptised) John Axtell married Mary Prosser at Yarnton. Elizabeth Osier initially brought up her son John on her own, but she died when he was about two, and he was then brought up by his father John Axtell and his wife Mary: henceforth he was known as John Osier Axtell. John and Mary Axtell had twelve children of their own, half-siblings to John: Anne (1814), Mary Ann (1815, died 1821), Anna (1817), Richard (1818, died aged 8), James (1821), Sarah (1823), Thomas (1826), Harriet (1828), Isaac (1832), Emmanuel (1834), George (1837), and Ann Catherine (1841). His father was a labourer. Harriet Bailey was born in Stedham, Sussex in 1815 and baptised there on 28 May. Katherine Mary Axtell (born in Oxford in 1857). John Axtell, who was a stonemason, and his wife Harriet began their married life in a divided house in Great Clarendon Street. They were living there at the time of the 1841 census they were living there with their first two children, Harriet (2) and John (five months). By 1845 the family had moved to Jericho Gardens (the name given to the area that lay between Jericho Street and Cardigan Street). John (37) and Harriet (36) can be seen there in the 1851 census with their first seven children: Harriet (11), John (10), Charles (8), Frederick (6), Fanny (4), William (2), and Elizabeth (three months). Their son Charles died in 1853 at the age of 11, and their son George in 1854 aged two. They were buried in Plot H.15 of St Sepulchre’s Cemetery on 29 September 1853 and 1 December 1854 respectively. Their son Frederick Osier Axtell also died around this time, but his burial is not recorded. John Osier Axtell’s father John Axtell died at Yarnton at the age of 66 on 1 February 1857 after three months’ illness, and his death was reported in Jackson’s Oxford Journal. Mrs Axtell had three more children George in 1852/3, Alfred in 1855, and Katherine in 1857 She died in 1860, leaving nine children aged between 3 and 20. † Mrs Harriet Axtell née Bailey died at Jericho Gardens at the age of 45 on 3 March 1860 and was buried at St Sepulchre’s Cemetery on 8 March (burial recorded in the parish register of St Paul’s Church). At the time of the 1861 census, John Axtell (46) was living at 13 Jericho Gardens and his eldest daughter Harriet (21) was acting as his housekeeper. Four of his other children were still at home: Fanny (14), Elizabeth (10), and Alfred (5), who were at school, and Katherine (3). The two missing children were John Robert (20) who was lodging in Croydon and working as a journeyman stonemason, and William (12), who was living with his uncle and aunt, Henry & Jane Bailey, in Midhurst, Sussex. John Robert Axtell, his eldest son, married Anna Louisa Westwood (20), the daughter of the brewer Henry Westwood of King Street, at St Paul’s Church on 10 July 1867. John Osier Axtell’s mother Mary died at Yarnton at the age of 77 on 4 January 1870, and her death was announced in Jackson’s Oxford Journal. At the time of the 1871 census John Axtell (56) and his two youngest children Alfred (15), who was working as an errand boy, and Katherine Mary (13), who was at school, were living in Jericho Street in the home of John’s daughter Mrs Harriet Harvey (30) and her husband Charles Harvey (36) and their son Henry Axtell Harvey (7). His son William (22), who was also a stonemason, was living in Gloucester Green with the gardener Stephen Phipps. His daughters Fanny (24) and Elizabeth (20) had probably gone out to service, but are hard to find in this census, as the name Axtell is frequently recorded wrongly by the census enumerators. On 29 December 1872 at St Mary Magdalen Church, William Henry Axtell married Jane Hunt, the servant of Thomas Tame, a wine & spirit merchant at 47 Broad Street. † John Axtell died at 20 Jericho Street at the age of 64 in May 1879 and was buried at St Sepulchre’s Cemetery on 14 May (burial recorded in the parish register of St Barnabas’s Church). Harriet Axtell, Mrs Harvey (born 1839) was living at 20 Jericho Street in 1881 with her husband Charles (43), who was still working as a general labourer, and their children Henry Axtell Harvey (17), who was a mason’s labourer; Charles James Harvey (9) and Ernest Edward Harvey (7), who were at school; and Edith Eveline Harvey (three months). Harriet was still living there in 1901, when she was a widow of 62, with her son Henry (37), who was a house painter, and her daughter Edith (20), who was a dressmaker. Mrs Harriet Harvey died in Oxford at the age of 70 near the beginning of 1910. John Robert Axtell (born 1840) was a stonemason. He and his wife Ann or Anna Louisa were living at 15 King Street in St Thomas’s at the time of the 1871 census with their first daughter. By 1881 they had moved to 6 Mount Street in St Thomas’s and had four children: Florence Lois Axtell (11), Frederick Axtell (8), Henry Bailey Axtell (5), and William (4); and another family of three was lodging with them. By 1911 John was a widower, and still working as a stonemason at the age of 70. His son Henry (35), who was also a widower and stonemason, was living with him with his two children. John Robert Axtell died in Oxford in 1921 at the age of 81. Fanny Margaret Axtell (born 1846) was working as a cook at 33 Palace Gardens Terrace, Kensington in 1891. She married the widower William Tasker, a stonemason of 25 Earl Street in Osney, at St Frideswide's Church on 7 November 1895, when she was 48, and they had no children. In 1901 they lived at 38 Chester Street in east Oxford; but by 1911 Fanny's husband was a farmer in Suffolk, and they lived at Brick Kiln Lane Farm in Glemsford. Mrs Fanny Margaret Tasker died at 6 Princes Street, St Ebbe's, Oxford at the age of 82 in 1929 and her funeral was held at St Ebbe's Church on 13 March. William Henry Axtell (born 1849) came back to Oxford to work as a stonemason, and he carved some of the gravestones in St Sepulchre’s Cemetery. 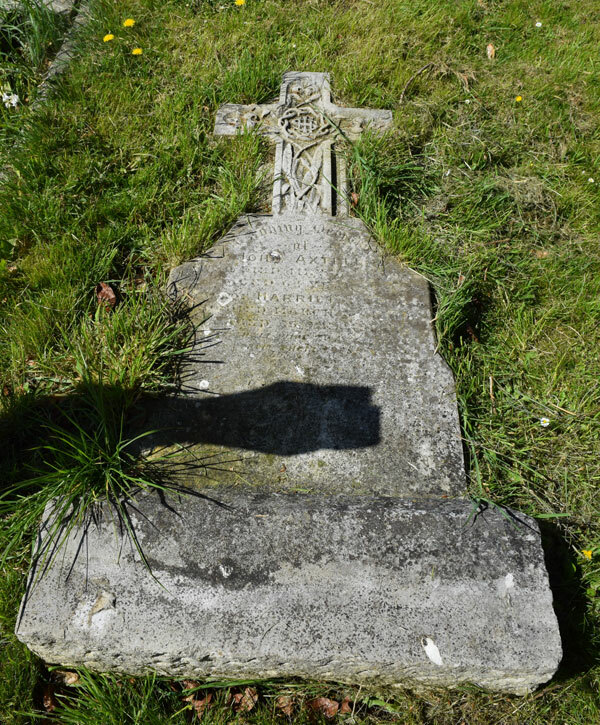 He and his wife Jane (30) had six children, but three of them had died by 1911. In 1881 William (32) and his wife were living at 19 Princes Street in east Oxford with their surviving children Fanny Katherine Axtell (5), Harriet Elizabeth Axtell (3), and George Axtell (2). In 1891 they were living at 13 Aston Street. They had moved to 23 Regent Street by 1901, and were still there in 1911. William Henry Axtell died at the age of 65 in 1914. Elizabeth Emma Axtell (born 1851) was working as a housemaid for the Revd Joseph Dodd at 55 St Giles’s Street in 1881 when she was 30. In 1891 she had her own grocer’s shop at 14 Bridge Street, St Ebbe’s. She was living at 45 Friars Street when she married the widower Charles Uzzell, a mason, at St Ebbe’s Church on 10 December 1895: she was 44, and they had no children. At the time of the 1901 census they were living at 95 Friars Street with two of Charles’s children by his first marriage, and Elizabeth was still keeping a shop there; by 1911 she appears to have given up her shop. Mrs Elizabeth Emma Uzzell died in Oxford at the age of 82 in 1933. Alfred Axtell (born 1855) was a schoolmaster in Bristol when he married Emma Mary Davey, of the School House in New Road, at St Peter-le-Bailey Church, Oxford on 1 January 1896. At the time of the 1911 census he and Mary were living at 5 Henleaze Road, Westbury on Trym, Bristol with their two daughters Winifred Axtell (13) and Mildred Axtell (8). Alfred Axtell died in Bristol at the age of 76 near the beginning of 1932. Katherine Mary Axtell (born 1857) was working as a cook in the household of a barrister in Croydon in 1891. On 18 September 1899 she married Enoch Webb of Swaffham Prior, Cambridge at the Congregational Church there, and the marriage was announced in Jackson’s Oxford Journal: she was aged 40, and they had no children. At the time of the 1901 census they were living at Lodge Farm, Chevington, Suffolk, where Enoch was farm bailiff; by 1911 they were living at 1911 Brick Kiln Farm, Cavendish, Suffolk, and Enoch was now described as a farmer. Mrs Katherine Mary Axtell died in Oxford at the age of 78 in 1936.